SYDNEY, Mar 18 2013 (IPS) - Australian Prime Minister Julia Gillard’s comments about foreigners taking Australian jobs in a speech made last week in Rooty Hill, the working-class heartland of Sydney’s western suburbs, has brought issues of immigration, asylum and race back into election campaigning. Opinion polls ahead of federal elections scheduled for September have indicated that Gillard’s governing Australian Labour Party (ALP) will likely lose the race by a huge margin to the opposition Liberal Party. Hostility towards boatloads of asylum-seekers who receive bridging visas to live and work here is on the rise. Meanwhile, the opposition claims that the government has lost control of Australia’s national borders. Gillard has now added yet another dimension to the anti-foreigner sentiments in the community by drawing attention to the abuse of the 457 visa programme by unscrupulous employers. According to a report in the Sydney Morning Herald this month, IT giant Mahindra Satyam was singled out for using the 457 visa system to move IT jobs out of Australia. The report claimed the Indian company had announced plans to increase its job headcount in Australia from 1,600 to 50,00 by bringing in IT professionals from India, Malaysia and the Philippines. According to a local IT consultant, the company brings in foreign IT professionals under the 457 programme on a three-month rotation basis to learn the system here, after which point they are dispatched back to their home countries, essentially moving scores of Australian jobs “off shore”. The consultant claimed he had lost his nine-year IT management job to such practices. A senior government insider told the media that voters believe the 457 skilled migrant visa programme had been abused by unscrupulous employers, with the result that Australian workers with suitable skills were being shunted to the back of the jobs line. Meanwhile, the opposition has been hammering the government hard on its asylum seeker programme, with immigration spokesman Scott Morrison insisting that asylum seekers living in Australia on bridging visas must have the “approval” of the local community because they could be a threat to social cohesion. Most of these asylum seekers come from Afghanistan, Iraq, Iran, Pakistan and Sri Lanka. Morrison’s statement follows the case of a Sri Lankan asylum seeker charged this month for a sexual attack on a university student in Sydney. But Dr. Mahmoud Yekta, an Iranian who settled in Australia over 30 years ago as a refugee and now works with minors who have arrived in Australia seeking asylum, told IPS that the asylum seekers he works with take extra care to be courteous to the people in the community. “Is (Morrison) going to etch circles or crosses on their foreheads for the community to be aware of them?” he asks. The programme allows eligible employers to address skills shortages that cannot be filled from the local labour market. It is the most commonly used Australian visa programme to sponsor overseas skilled workers on a temporary basis, for up to four years. The programme is uncapped and driven by employer demand. At the end of January, according to recently released statistics from the Immigration Department, 105,330 foreigners were currently working on 457 visas, an increase of 25.6 percent from a year ago. With 20 percent, Indians topped the list of 457 visa holders, followed by the UK, Ireland and the Philippines. A majority of these visa holders are believed to be working in the government healthcare system where there is a shortage of skilled personnel including doctors and nurses. Another area popular among employers and foreign workers is the booming mining industry. The latest official immigration statistics indicated that, by Jan. 31, the most popular professions for 457 visa holders were as IT specialists, cooks, marketing specialists and medical practitioners. Focus group research being conducted for the governing ALP this month has indicated that Premier Gillard’s “Aussie jobs first” campaign slogan has tested favourably with voters, especially in Labour’s strongholds such as the sprawling western suburbs of Sydney and Melbourne. 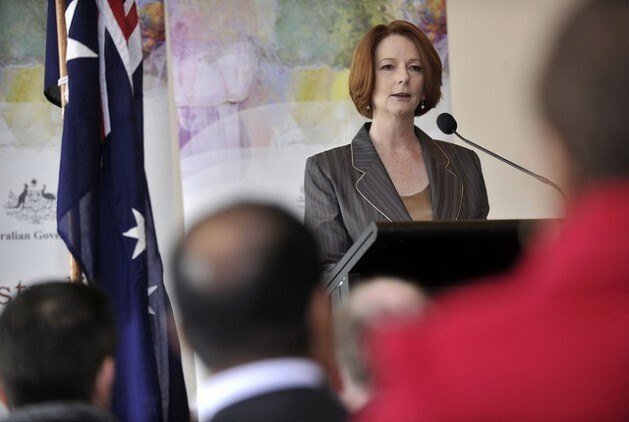 Gillard’s comments are linked to the decision on Feb. 23 by Immigration Minister Brendan O’Connor to further tighten the conditions under which the visas are issued amid mounting pressure from the union movement to toughen the rules. But many political and social commentators here believe that the Prime Minister’s comments were also a veiled reference to local resentment towards the influx of asylum seekers. Jakubowicz told IPS that the 457 visa is a human rights question more than a racial or economic issue. But when “everyone in the commentariat says it’s a dog whistle, then it becomes a dog whistle for racism”. The unions, which back the ALP, have for a long time been at loggerheads with the government over the temporary visa. They are a formidable lobby group, though their power to cripple business has been curtailed by reforms to collective bargaining laws over the past two decades. In May 2012, they opposed a government decision to allow billionaire mining magnate Gina Rinehart to hire 1,700 foreign workers to be employed in the Roy Hill mining project in the Pilbara region of western Australia. Meanwhile, opposition leader Tony Abbot has come out in support of the 457 programme. He said one of the most “jarring” aspects of the prime minister’s approach was the “assault” on foreigners. The opposition leader said a government under his party would make the 457 visa a mainstay of their immigration policy. His view has found strong echo among the business community. Australian Mines and Metals Association Chief Executive Steve Knott said up to 80 percent of miners had used or planned to utilise the 457 visa programme. Saleh Saqqaf, a Jordanian who has lived in Australia for over 30 years and is an Arabic language broadcaster here, argues that the debate should focus on the working conditions foreigners face here. “Are they treated fairly and given the same wages as Australians? Why can’t Australians be trained for these jobs?” he asked. If foreigners “are brought here to be paid less money than Australian people, then obviously the Australians are upset. This is not racism,” he told IPS. “The Arabic community has the highest unemployment rate in this country and many people wonder why they can’t be trained for these jobs”, rather than having to compete with immigrants.